NEBRASKA CITY, NE (NET RADIO) - It's a loud place. But much cleaner than you might expect for a coal plant. This Nebraska City station, just south of the community, is ten stories of pipes, boilers and a huge air ventilation system. Large enough, it seems, that a small car could fit inside the air ducts. 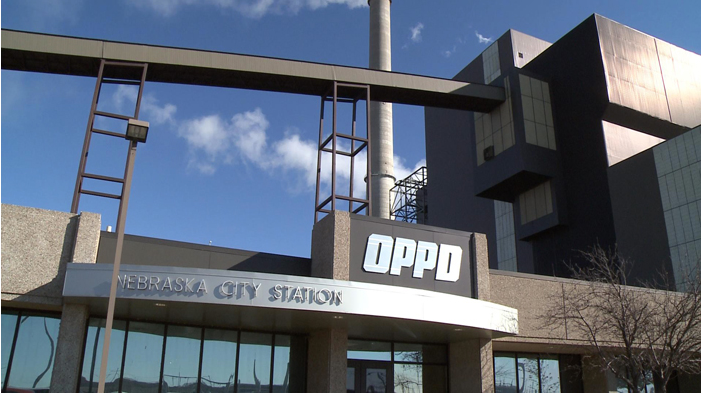 As operations superintendent of the Omaha Public Power District facility, Roger Grable already knows the place well. "The facility is very complex," he said, "and it can take days, actually, to do this full tour if we really wanted to." Students from Nebraska City High School tour the Omaha Public Power District plant in Nebraska City as part of the Energy Academy. Unit 4, Energy Responsibility and Decisions: The student will explore society's responsibility in energy usage and how it affects the environment. Grable is leading a tour of high school students who have more than a casual interest in energy. He talks loudly over the operation of the plant. "'This here is one of the coal feeders, conveyor belt; coal falls from the silo onto the belt, we control the rate the belt turns and control how much coal we ultimately put into the boiler." A primary purpose of education is putting students in a position to work after completing school. A unique educational program has resulted from putting energy and school together. The students touring the plant are part of the Energy Academy, so Gable offers more science than he might on other tours. "If you understand some of the basics, the steam cycle, the thermal cycle, and just how we handle the coal, what processes we go through for preparing that coal and then putting it into the boiler - those were kind of the basics of a conventional power plant that I was trying to get to them," he said. "And then we also did talk a little bit about the emissions control that we do." Grable is a role model for Energy Academy administrators. He grew up nearby in Auburn and came back to the area after college for a career in energy. He sayidthere will be a place for many like him in the industry in the future. "We have steam fitter mechanics, who are primarily welders; valve technicians, anything to do with our piping components; we have electricians - obviously in a power plant you have a lot of electricity going around. "If somebody's interested in the science field, technical field, and especially engineering," he said, "we utilize a lot of engineers here on site, and also in our district as a whole. I think you need to have those bright young minds that are interested, that can go transform our energy industry as a whole. It's changing very quickly." The Energy Academy is a program Educational Service Unit number four started this school year. ESUs are regional education service providers throughout Nebraska. ESU four serves the far southeastern corner of the state, partnering with schools like Nebraska City High School. Teacher Jim Nemec brought the class along on the field trip to the coal plant. He said the Energy Academy is helping students learn there's a lot behind the scenes in the energy industry. "I think it's opening up their eyes to it," he said. "We go under the assumption, We flip the switch, we're going to get electricity and it's going to be there.' So we take it for granted." OPPD and other utilities are partners in the Energy Academy. Meshelle Ferguson with the Nebraska Public Power District sees the academy as a way to bring more energy awareness to young citizens and their science education. "The first component of the Career Academy is introduction to energy," she said. "And it's everything basic, from battery, how you hook batteries up to turn a light bulb on, to hand-held generators that the kids turn and they can see Christmas bulbs light up. And hands-on type of activities related to energy as well as the careers in the energy field. "Having that awareness, even if a student that goes to the Career Academy decides to pursue a different career, I think they have a better base of knowledge related to energy in what goes on behind," she continued. Utilities also have an interest in informing students about careers in the energy industry. Marc Serrett is with OPPD human resources. "In some areas we have a real shortage of qualified workers, like our nuclear operators, for example, our power plant operators," he said. "There's so many of our people that are retirement-eligible that there will be a shortage until we can get them trained back up." So in addition to inviting students to their facilities, utility officials are going to the classroom. Serrett recently visited Lewiston High School's energy class. "A lot of people don't grow up thinking, I want to get a job in the energy field,' or I want to go work for the power company,'" he said. "So it's important for us to get out and talk to you so we can give you a preview. "We've changed more in the last three years than we had in the previous 25, just because of new power sources," Serrett continued. "New regulation is driving a lot of change in our industry now, and you're going to see rapid technological changes which require a whole new skillset." Sarah Bennett is Lewiston's Energy Academy teacher. She said the class has two valuable components for students. "With any school, it's preparation for the future, and that's what I see myself and a school system as, because if we don't prepare them, than how else are they going to get prepared?" she said. "So yeah, we do the subject matter because that's important for the background in the science, but then teach them about the different careers." Students say the academy is making them think about energy in new ways. Austin Schmutz is a junior at Lewiston high school. "What you can do to conserve energy that's what we talked about in our first unit, was how to conserve energy," he said. "Running water that uses energy, and I didn't think about that; like the water heater, when you are using water and keep it running, it uses more energy." Lewiston senior Tim Benson has seen value in the field trips the academy offers. "The other day we went to a robotics workshop and learned about gear ratios and stuff like that," he said. "And some other electrical things and what career fields we could go into along with that." Back at the coal plant tour, Schmutz and Benson said they learned how important water is to energy generation. "I thought it was pretty sweet how they said they used the water to push the coal into the combustion chambers," Schmutz said. "I'd never been in a power plant before." "There's a lot more with the water than there was with the actual coal," Benson added. "And they showed how they brought it in and how much pressure and stuff there was with it." Ferguson with NPPD said the Energy Academy might make students interested in science occupations not related to energy. "By going through that energy academy, they're going to want to get a flavor for what life in an energy-related world is," he said. "But they can also see, if a chemist comes in and talks to them about what they do at a power plant, they might get interested and say, I don't want to be at a power plant, but maybe I'll go to pharmacy school or I want to go in to, you know, another area that has some science or chemistry-related field.'" He said the prospects for employment can bring young people back home, and that's good for Nebraska. "It's a huge concept," Ferguson said, "in terms of, you see the initiatives of having Nebraska workers return home and keeping our economy and having our industries healthy." That's a concept that Grable agrees is good for the local economy and the energy industry, and he sees the students getting it. "I think they understand the importance of it," he said. "And that's something that we need to all keep in mind as we go forward. Reliability of our energy infrastructure and the generation capabilities, and that is very, very important." That's something teacher Jim Nemec from Nebraska City High School is learning as part of the Academy, too. "When you start to dig into it and look at, like the tour today, all the different jobs that they were able to take a look at," he said, "and see that there are positions available and they're local and it's a good opportunity for them." With coal, nuclear and wind energy facilities all in place in southeast Nebraska, Energy Academy administrators are hoping to show students with an interest in science they can find a career in energy and stay close to home. That was interesting. I think that it will be a good idea to add here more facts on their history. Get a look at these college admission essay examples so you can find out lots of cool tips on related topics.